Researchers at Vanderbilt University have identified a potential new drug target in subtypes of lung cancer that are difficult to treat. In the study, published in the current issue of the Journal of Clinical Investigation, the researchers showed for the first time that the target, a receptor called EPHA2, promotes lung tumor growth by modulating a specific cell survival pathway. 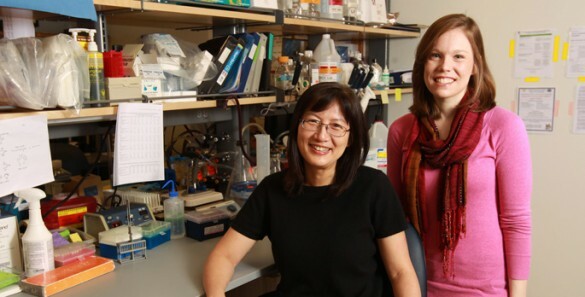 In collaboration with colleagues at Harvard Medical School, they also identified a small molecule compound that blocked the receptor’s activity, killed human lung cancer cells in culture and reduced the size of lung tumors in a mouse model. More studies are needed before the compound can be tested in humans, said senior author Jin Chen, M.D., Ph.D., professor of Medicine, Cancer Biology, and of Cell and Developmental Biology at Vanderbilt. Yet this is another step toward a more personalized approach to treating lung cancer, she said. By discovering and targeting specific “vulnerabilities” in a patient’s tumor, as this study showed with EPHA2, ultimately doctors should be able to provide more efficient and effective personalized treatment and care, she explained. High expression of the EPHA2 receptor had previously been correlated with overall poor patient survival in lung cancer. But until now the biological mechanism and translational potential of these observations were not known, Chen said. The Vanderbilt team found that EPHA2 promotes tumor growth in a variety of genetic subtypes of lung cancer, including those with a mutated form of the enzyme KRAS, for which there are currently no treatments. It does this by modulating a cell survival pathway involving a protein called BAD. Blocking or genetically deleting the receptor led to the death of cancer cells and smaller or fewer lung tumors in mice. Amato screened more than 50 small molecule compounds predicted to inhibit EPHA2 that were synthesized in the Harvard lab of Nathanael Gray, Ph.D. A compound called ALW-11-41-27 “stood out” as being the most effective, both in blocking the receptor’s activity, and in inhibiting cancer growth. Other co-authors on the Vanderbilt faculty were Justin Cates, M.D., Ph.D., (Pathology, Microbiology and Immunology); Fei Ye, Ph.D., (Biostatistics); Rebecca Cook, Ph.D., (Cancer Biology) and Dana Brantley-Sieders, Ph.D. (Medicine). Vanderbilt postdoctoral fellow Shan Wang, Ph.D., Vanderbilt graduate students Andrew Hastings and Victoria Youngblood, undergraduate students Pranav Santapuram (Vanderbilt) and Haiying Chen (University of Melbourne), Daniel Colvin, Ph.D., (Vanderbilt University Institute for Imaging Science) and Harvard postdoc Li Tan, Ph.D., also contributed to the research. The research was supported by pilot project grants from the Vanderbilt-Ingram Cancer Center’s Thoracic Program, a U.S. Department of Veterans Affairs Merit Award, the Vanderbilt International Scholar Program, and by National Institutes of Health grants CA095004, CA173469, CA167878, CA090949 and CA068485.